Your administration was built on the enduring principle that the U.S. government will stand up for American workers against foreign governments that break their trade agreements with our country. The American people are grateful for that promise. Today, America’s airline workers are counting on you to step up on their behalf. In January 2018, your administration reached a historic agreement with Qatar over its Open Skies violations. While we hoped this agreement would hold Qatar accountable and force its heavily subsidized airline, Qatar Airways, to follow the rules and stop hurting American workers, that did not happen. Today, Qatar Airways is ignoring the 2018 agreement that your administration signed by using massive government subsidies to launch new routes to the United States through its stake in Air Italy. Air Italy was a struggling regional carrier until Qatar Airways injected tens of millions of dollars into the company to circumvent the agreement and expand its U.S. presence. In the last few days, Qatar Airways has used its Italian proxy to launch routes to Los Angeles and San Francisco, and added flights to Miami – a further effort to undermine U.S. airlines. Simply put, Qatar Airways represents a grave threat to American jobs and the health of the airline industry. No rule-abiding business can compete with a massively subsidized airline that ignores economic realities and can wipe away losses with one infusion of government cash after another. its agreement with the United States and affirm that we will not tolerate these continued infractions. We appreciate your resolute leadership in enforcing fair trade principles and ask that you continue to stand up for the more than 1.2 million U.S. workers whose jobs depend on a strong and vibrant passenger airline industry. This entry was posted in Air Italy (3rd), American Airlines, Delta Air Lines, United Airlines and tagged Air Italy (3rd), American Airlines, Delta Air Lines, United Airlines on April 21, 2019 by Bruce Drum. Delta Air Lines currently operates a dwindling fleet of 40 McDonnell Douglas MD-90-30s. During its first quarter earnings call, Chief Financial Officer (CFO) Paul Jacobson, announced the company will now accelerate the retirement of its remaining MD-90s. The airline will provide a more definitive retirement schedule later in the second quarter. Related to this, Delta also plans to retire the last McDonnell Douglas MD-88 in 2020. The MD-90s will be the end of line of operating McDonnell Douglas jets by Delta. Top Copyright Photo (all others by the airline): Delta Air Lines McDonnell Douglas MD-90-30 N902DA (msn 53382) FLL (Bruce Drum). Image: 101323. 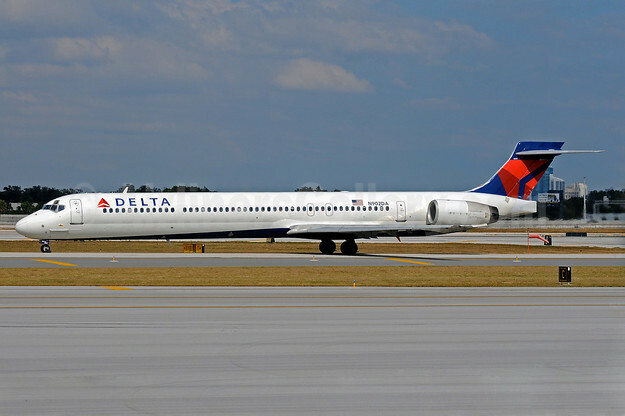 This entry was posted in Delta Air Lines and tagged Delta Air Lines, McDonnell Douglas MD-90-30, msn 53382, N902DA on April 13, 2019 by Bruce Drum. Delta Air Lines today reported financial results for the first quarter (March) 2019 and provided its outlook for the second quarter 2019. Highlights of the first quarter 2019 results, including both GAAP and adjusted metrics, are below and incorporated here. • Celebrated the commitment of the Delta people through $1.3 billion in profit sharing for 2018 performance, the second largest profit sharing payout in the airline’s history. • Achieved Delta’s highest overall ranking in Fortune’s Most Admired Companies for 2019 and ranked first for the eighth time in the past nine years as Fortune’s Most Admired Airline. • Introduced a paid day of service for all employees, building on Delta’s commitment of donating 1% of profits to charitable organizations, through approximately 640,000 hours of community service. • Filed with the U.S. Department of Transportation for additional service to Tokyo-Haneda airport, proposing to expand Delta’s operational reliability and exceptional customer service to more customers flying across the Pacific. • Debuted Delta’s state-of-the-art A220 (above), flying from Delta’s New York-LaGuardia hub to Dallas/Ft. Worth and Boston and from Delta’s Detroit hub to Dallas/Ft. Worth. • Completed $1.3 billion in share repurchases, opportunistically repurchasing 26 million shares and reaffirming Delta’s commitment to consistent shareholder returns. The Board of Directors has set the airline’s annual meeting of shareholders for 7:30 a.m. EDT, June 20, 2019. The meeting will be held at the offices of Davis Polk & Wardwell LLP, 450 Lexington Avenue, New York, New York. This entry was posted in Delta Air Lines and tagged Delta Air Lines on April 10, 2019 by Bruce Drum. Customers who are holding reservations for these cities on the dates noted above, and want to alter their travel plans may rebook in the original class of service or travel standby (within 14 days of their original date of travel between the original city-pairs and in accordance with our accommodation procedures) without paying any additional charge. Delta has proactively issued two weather waivers ahead of a winter storm Wednesday and Thursday for the Upper Midwest area and Colorado. This latest winter system is expected to bring frozen and mixed precipitation to Delta’s Minneapolis/St. Paul hub and surrounding cities, spanning from the Upper Peninsula of Michigan, down through Central Minnesota and down into eastern South Dakota and Colorado. Winter precipitation is slated to begin Wednesday afternoon through Thursday, prompting the potential for schedule adjustments Thursday as a result of field conditions at airports in the region. Both the Upper Midwest and Colorado waivers allow customers traveling to, from or through the cities included to make a one-time change to their itinerary without incurring a fee. Delta’s Meteorology team continues to keep an eye on the late-winter storm system, closely analyzing the latest data from various weather forecasting models as the storm moves through the Rocky Mountains. Factoring in the mountainous typography and other variables, each model has provided separate, though converging, forecasts for cities in the Upper Midwest region and Colorado. As the system approaches, the weather prediction models are expected to more closely align on precipitation amounts, wind speeds and timing, allowing the airline’s meteorologists to provide the most accurate and detailed information to Delta’s operations teams. They’ll use that information to plan for any necessary changes to flight schedules to minimize the operational impact. Delta’s Meteorology team in the airline’s Operations and Customer Center are keeping an eye on a late winter storm system that is expected to bring frozen and mixed precipitation to the Northern Plains of the United States Wednesday afternoon through Thursday. Moving east from the Pacific Northwest region Monday, specifics around timing, precipitation totals and wind speeds are still coming together as Delta meteorologists analyze the latest weather model data. Details around the storm will likely be better defined Tuesday after the system crosses the Rockies. Wind speeds and precipitation totals will be better projected as the storm moves eastward from the Pacific Northwest. Customers can check their flight status by visiting Delta.com, checking the Fly Delta Mobile App, opting in for updates sent directly to their mobile device or via email with a One-Time Flight Notification. This entry was posted in Delta Air Lines, Southwest Airlines and tagged Delta Air Lines, Southwest Airlines on April 10, 2019 by Bruce Drum. Delta Air Lines is building on its position as the leading global carrier in Boston and New York with the launch of two new international routes – nonstop service from Boston’s Logan International Airport and New York’s John F. Kennedy International Airport to London’s Gatwick Airport will begin next summer in partnership with Virgin Atlantic. London-Gatwick will be the eighth nonstop trans-Atlantic destination from Boston on Delta and its partners, who together offer up to 13 daily flights between Boston and Europe. In New York, the additional flight adds to Delta and Virgin’s combined eight daily flights to London-Heathrow – and three additional daily flights to Edinburgh, Glasgow and Manchester – from Delta’s JFK hub. Delta and its joint venture partners together offer their customers the most transatlantic flights and seats out of the northeast United States. Full Gatwick schedule details will be announced later this year. The London-area airport was the destination for Delta’s very first transatlantic flight more than 40 years ago, when service began from Atlanta. Delta is also enhancing its aircraft on all flights between London-Heathrow and both Boston and JFK. Beginning this week, Delta flights between Boston and London-Heathrow will operate on an Airbus A330-200, which already serves Delta’s JFK-Heathrow flights and features additional premium seats. And in November 2019, the airline will introduce on these routes fully refurbished Boeing 767-400s, featuring a modern interior and all four branded seat products – including a more private Delta One experience, Delta Premium Select, Delta Comfort+ and Main Cabin – to give customers greater choice when they travel. Delta’s refreshed 764-400 aircraft will also feature the new wireless IFE system developed by Delta Flight Products with seat-back entertainment screens in every cabin and thoughtful touches like full-spectrum LED ambient lighting and memory foam cushions throughout the aircraft for added comfort. In addition to the new Gatwick service, Delta’s existing transatlantic offerings also continue to grow. The airline this summer will add a second daily flight from JFK to Tel Aviv and a second daily flight from JFK to Paris, along with a third daily frequency from JFK to Amsterdam that will begin in October 2019 and operate four times per week. The Tel Aviv and Paris flights will be served by Airbus A330-300 aircraft; the Amsterdam service will operate on a Boeing 767-300ER. Delta has doubled domestic daily departures out of Boston since 2013 and this year will serve four additional domestic destinations – Cleveland, Chicago, Washington-Reagan, and Newark-Liberty – while also adding more frequencies in another seven key domestic markets. Delta CEO Ed Bastian visited Boston in March 2019 and announced the airline’s plans to assume operations at all gates at Logan’s Terminal A by the third quarter of 2019, growing Delta’s airport footprint by five gates. Delta also plans by 2020 the expansion of its Delta Sky Club near gate A18, including new showers, expanded seating and a reimagined food and beverage area. This entry was posted in Delta Air Lines, Virgin Atlantic Airways and tagged Delta Air Lines, Virgin Atlantic Airways on April 4, 2019 by Bruce Drum. The new flights connect Minneapolis/St. Paul with Seoul, South Korea, and Seattle/Tacoma with Osaka, Japan. Flights are first additions to the Delta-Korean joint venture’s network since the partnership launched in May 2018; Boston-Seoul service operated by Korean Air also launches April 12. ​Delta is bringing customers more options for travel across the Pacific with direct service launching today connecting Minneapolis/St. Paul with Seoul, South Korea, and Seattle with Osaka, Japan. The two new Delta flights, together with Korean Air-operated service between Boston and Seoul beginning April 12, are the first additions to the partnership’s network since the joint venture launched in May 2018. In addition to enjoying among the best connections between the Midwestern U.S. and Asia, customers on Delta’s new Seoul-Minneapolis/St. Paul flight will enjoy will airline’s award-winning service onboard a newly upgraded 777-200ER. This aircraft features all new cabins, including 28 award-winning Delta One suites with a full-height door, memory foam seats and state-of-the-art design; 48 Delta Premium Select cabin seats with elevated personal service, plated meals and more space to stretch out with recliner seat rows; 90 seats in Delta Comfort+ and 112 all-new Main Cabin seats – the widest in the Delta international fleet – in a nine-abreast configuration. The new cabins enjoy in-seat USB and 110V power ports, inflight Wi-Fi and new dynamic LED lighting that varies by phase of flight fostering a relaxing, refreshing environment onboard. These flights also feature menus in all cabins crafted by Michelin two-star Chef Kwon Woo Joong. The service is Delta’s second trans-Pacific nonstop flight from its MSP hub, complementing existing service to Tokyo-Haneda. The Seattle/Tacoma-Osaka route represents a significant addition to the Delta and Korean Air trans-Pacific joint venture partnership, which serves 12 destinations in Japan — giving shared customers optimized schedules, a more seamless customer experience and improved loyalty program benefits. Delta is deploying Boeing 767-300ER aircraft on the new route, equipped with 25 fully flat-bed seats in Delta One, 29 seats Delta Comfort+ and 171 seats in the Main Cabin. Delta operates more than 150 peak-day departures to more than 50 destinations from its hub at Seattle-Tacoma International Airport. Delta is Seattle’s fastest-growing airline, growing by more than 50 percent since 2012 and 5 percent this summer. This entry was posted in Delta Air Lines, Korean Air and tagged Delta Air Lines, Korean Air on April 2, 2019 by Bruce Drum. This entry was posted in Delta Air Lines and tagged Delta Air Lines on April 2, 2019 by Bruce Drum.